Thousands of years ago, in Mesopotamia and the lands along the Mediterranean Sea, people mixed pure olive oil with herbal essential oils to use in anointing and honoring individuals of high rank such as kings and pharaohs. While that tradition no longer exists, Can Solivera - with the help of the famous Dutch perfumist Bert van Kooten has created a unique and contemporary perfume based on Arbequina extra virgin olive oil which Van Kooten called "the ultimate agent for uniting the outstanding qualities of different natural essential oils in full harmony." The result is a sensually stimulating and irresistible fragrance called Daida. This concentrated perfume calls to mind the scent of mandarin and almond blossoms along with a trace of herbs, wood and wild summer fruit, but is always fresh and fleeting, like a pleasant Mediterranean breeze. The olive oil in the formula is like a balsam for your skin, drawn in within seconds without leaving a greasy spot. 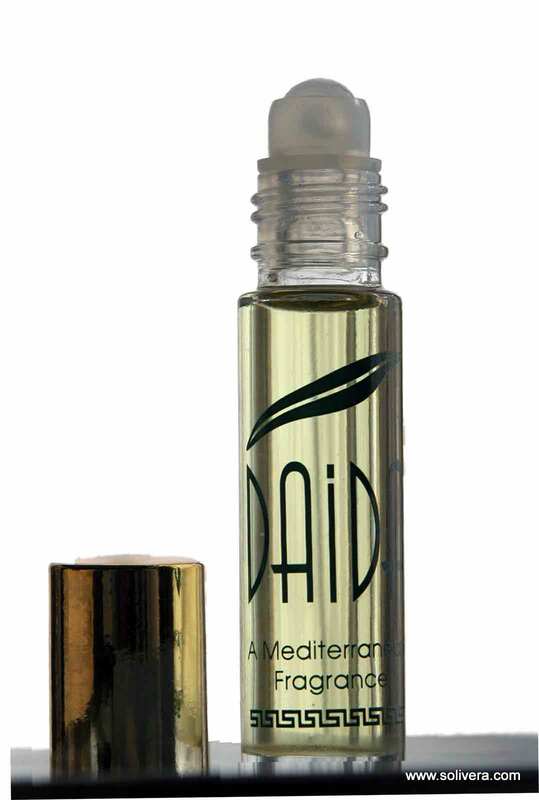 Daida perfume concentrate does not contain alcohol (ethanol), which is aggressive to the skin. This is why it is offered in a roll-on flask, because a spray bottle requires a considerable amount of alcohol to keep its mechanism functioning. Natural essential oils are highly concentrated and intensely aromatic. They are usually extracted through steam distillation from bunches of handpicked flower petals and other parts of plants. In ancient times they were applied undiluted, primarily to counteract stress, anxiety and emotional exhaustion, but also to stimulate the libido. Natural essential oils were rediscovered in the modern age and are becoming increasingly popular (e.g. in connection with aromatherapy).